The sound of a dying hard drive can be terrifying. It means a headache, downtime, and replacement costs in the best case. In the worst case, it means sending the drive to a data rescue lab. Using a redundant array of independent disks with mirroring (RAID 1), you can make a drive failure less of a nightmare. RAID 1 is one of several RAID "levels," and is the polar opposite of it’s speedier cousin, RAID 0 . Where RAID 0 stripes data across drives to attain higher read and write performance, RAID 1 writes the same data across all the drives in the array. Using RAID 1, the chances of losing data to a drive failure is one divided by the number of drives in the array. In comparison, those chances are multiplied in RAID 0. If you’re thinking that RAID 1 is a lazy man’s backup, think again. RAID 1 is not a backup, and is never, ever a replacement for a good backup. Always remember that RAID 1 is a hedge against hardware failures, not malware or corrupted data. If you get a virus on one drive in a RAID 1 array, every drive in the array will have the virus written to it. A proper backup keeps data safe from the system. With all that doom and gloom about RAID 1 not being a backup, you’re probably asking, "Why even bother with RAID 1?" The answer is pretty simple: If one drive in your RAID 1 array dies, the array will happily keep functioning, using one of the other drives for read and write operations. The failure will be nearly invisible to the user, as the RAID software should make the switch automatically. That's a big safety net for systems that simply cannot have downtime due to hardware failures. 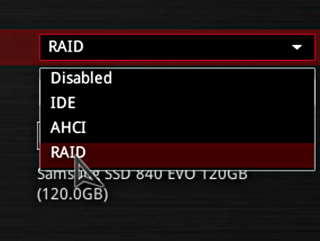 Just as with RAID 0, it’s ideal to use identical drives in a RAID 1 array. If one drive is a different make, model, or isn’t in mint condition, the array will only write as fast as the slowest drive. If a file is successfully written to a faster drive, the system will wait for the write to the slower drive to catch up. In addition to using identical drives, be sure to use the same interface for the drive. If two drives in your array are using SATA 6Gb/s and the third is using SATA 3Gb/s, the array will throttle back to 3Gb/s. It’s also a good idea to make sure all of the drives in your array are using the latest firmware. This can be especially important when using SSDs. If you’re going to use FakeRAID, make sure your motherboard supports it. Most recent motherboards do, but if you’re building a server out of an old machine, this is something you should check. Finally, if you're going to be using a disk that has data on it in a RAID array, back up that data before you begin. Creating a RAID 1 array in Windows is pretty simple, the trick is finding out what the utility is called. Microsoft opted for the name "Storage Spaces" instead of RAID, but the function is essentially the same. To start, hit Win+S and search for "Storage spaces" and launch the utility. Next, click create a new pool and storage space . You’ll be prompted for administrator access. Click Yes to continue. Windows 8's built-in RAID utilities are referred to as "Storage Spaces." You’ll be greeted by a windows showing all the unformatted disks that can be used. Select all the disks you want in the array and click Create pool . Storage Spaces will allow you to create a pool with any unformatted drives attached to the system. Next, give the pool a name and drive letter. The name will appear as the drive label. Select NTFS as the filesystem. For Resiliency type, select Two-way mirror . This is the equivalent to RAID 1. When you’re ready, click Create storage space to create the array. For RAID 1 functionality in Storage Spaces, select "Two-way mirror." If you want to remove a RAID array for any reason, simply click Delete next to the storage space you want to remove. To remove the pool, remove all of the storage spaces in it first. Next, we're going to cover setting up RAID 1 in Linux, and using your motherboard's onboard FakeRAID .